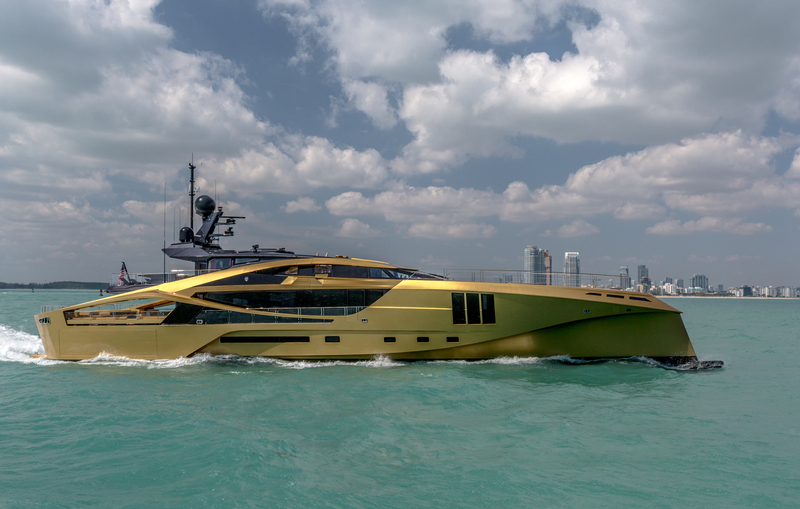 This 49M SUPERSPORT MOTOR YACHT is a striking golden vessel built by Palmer Johnson in 2015 with a GRP hull and superstructure - the first of her kind measuring 49m/161ft. The naval architecture comes courtesy of Palmer Johnson, with exterior styling and interiors also completed by the builder. 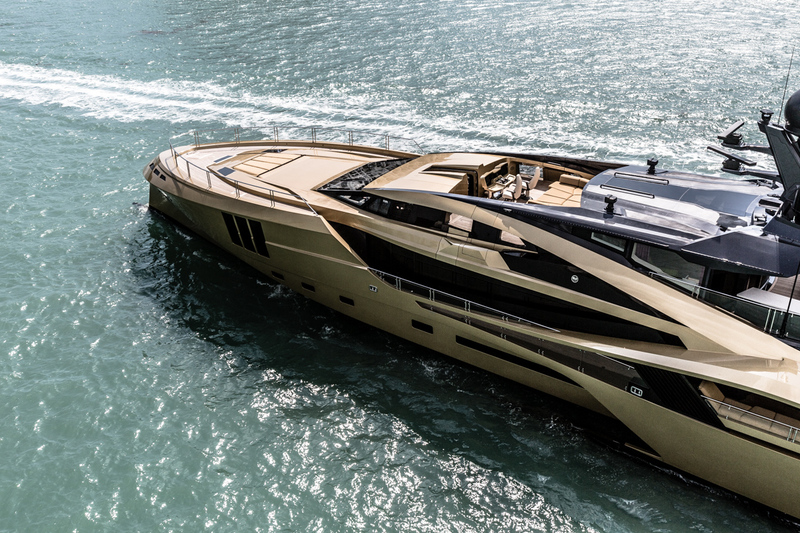 Combining childish playfulness and sophisticated detailing with a Middle-eastern and Asian motif, motor yacht KHALILAH will at once appeal to adults and children on charter holiday or celebrating a formal occasion. 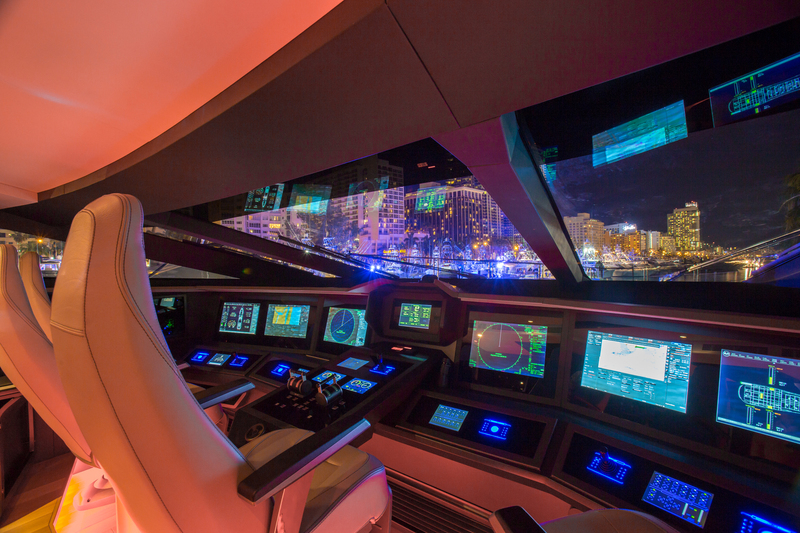 While cruising, she sleeps a maximum of 11 guests over five en-suite cabins. 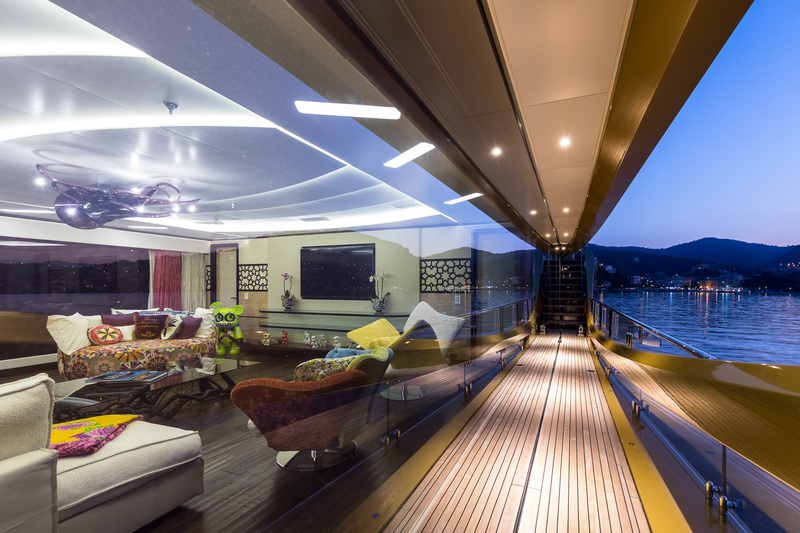 The lower deck contains a swim platform, from which guests can access the water as well as the toys and tenders. 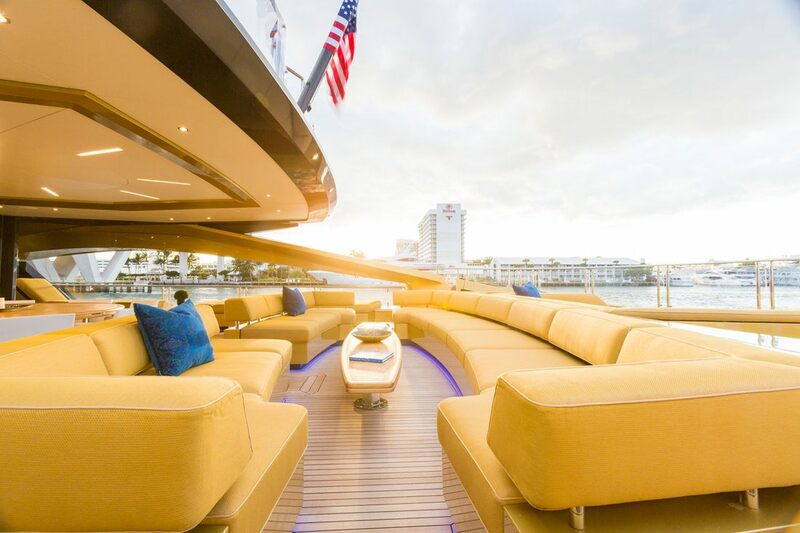 Above, the main deck aft is the ideal relaxation area with aft sunpads and an abundance of seating for alfresco dining and socialising in the sunshine. On the bow, there are more sunpads where guests can soak in the sunshine in tranquil surroundings. 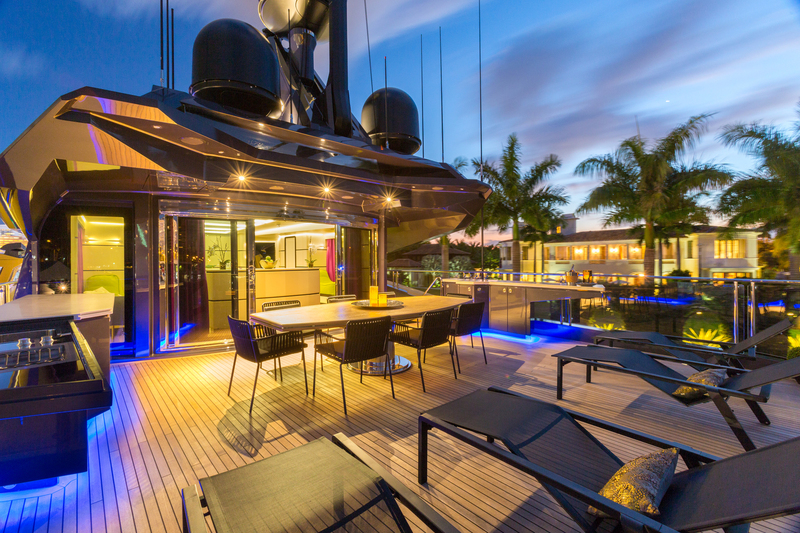 Above, the sundeck is split into two sections: The aft section host the formal alfresco dining area which seats up to 11 guests and sun loungers are placed along the stern for unwinding outdoors and marvelling at the panoramic views. The sundeck forward hosts a secluded Jacuzzi for calming days and nights savouring the surroundings. From the lower deck swim platform guests have access to the large beach club, providing an indoor/outdoor space for guests to rest. 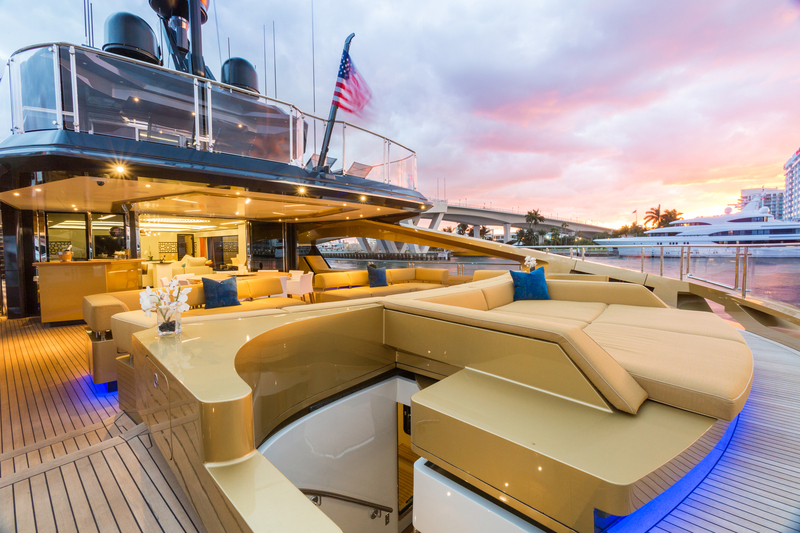 The water toys collection is located on the port side, while starboard is the tender garage. Both sections use side hatches for launch and retrieval. 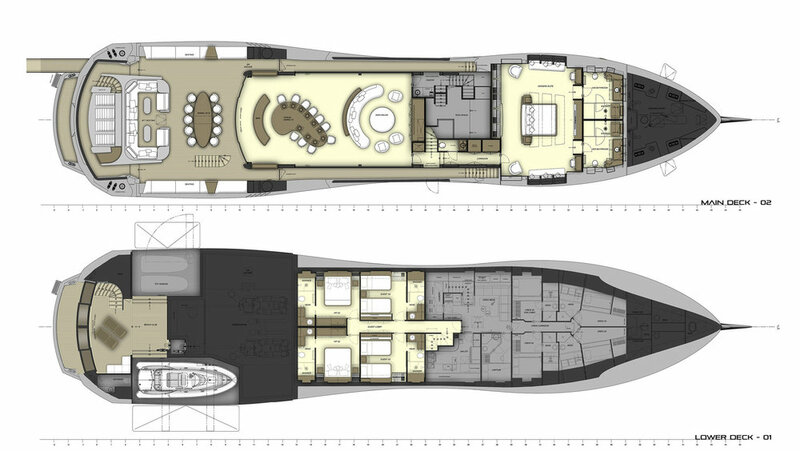 Next is the engine room and the majority of the guest accommodation is placed amidships, where there are two VIP staterooms, one double cabin and one twin cabin. The crew accommodation, galley and mess are positioned forward. The Master suite takes advantage of its position on the main deck forward to use the full beam and large windows for a brightly-lit space, within which there is a sofa and armchair on either side as well as two desks and a widescreen TV, while his and hers bathrooms are placed forward. Behind the main foyer is the formal dining area and the main salon, which share the same grand space for easy circulation while entertaining. The main salon is placed forward and uses a massive C-shaped sofa and large individually-styled armchairs surrounding a coffee table, in front of which is a widescreen TV. The formal dining area is positioned aft to get the most natural light from the floor-to-ceiling windows and the glass sliding doors, and a bar positioned near the entryway will serve guests out on the main deck aft as well as indoors. Above, the upper deck hosts a spacious lounge lit from above by skylights with spacious windows either side providing illumination to guests lying on the chaise loungers or the chairs. The central area has a U-shaped sofa where guests can recline after a satisfying alfresco meal. 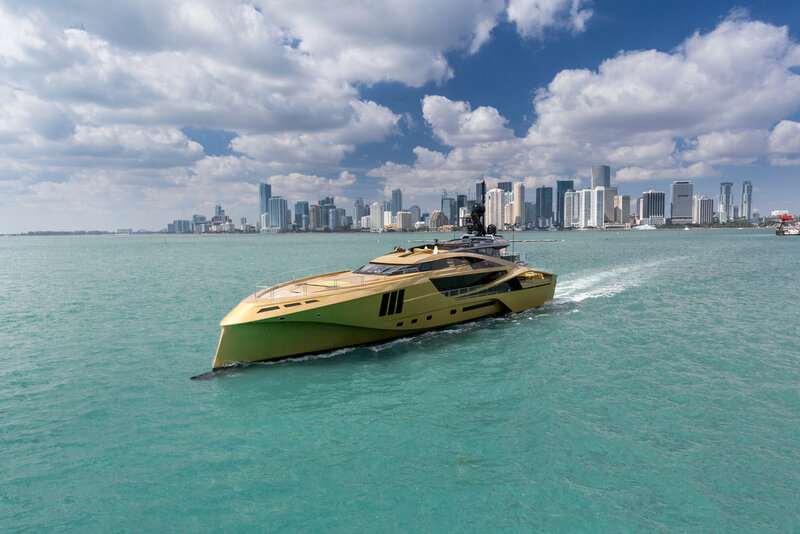 Twin 16V MTU diesel M94 engines produce 5,200 HP for a cruising speed of 20 knots and a top speed of 27 knots. 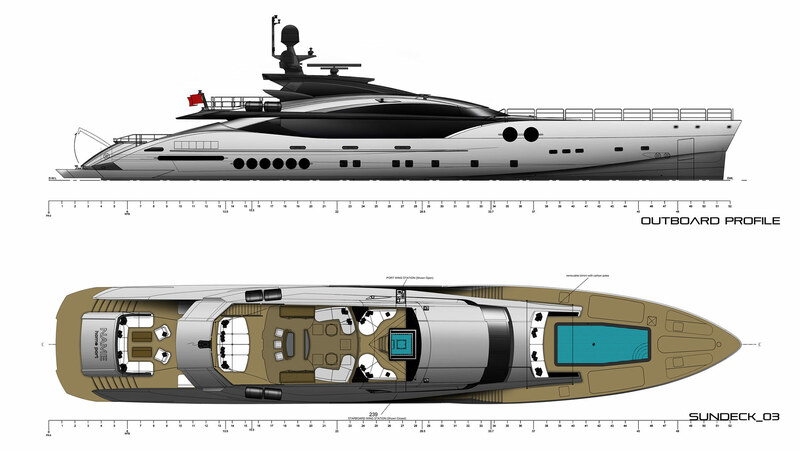 While at economical speed, she is capable of a range of 3.600 nautical miles. The accommodation sleeps up to 11 charter guests over 5 en-suite cabins: 1 Master suite, 2 VIP staterooms, 1 double cabin and 1 twin cabin, which is ideal for children. 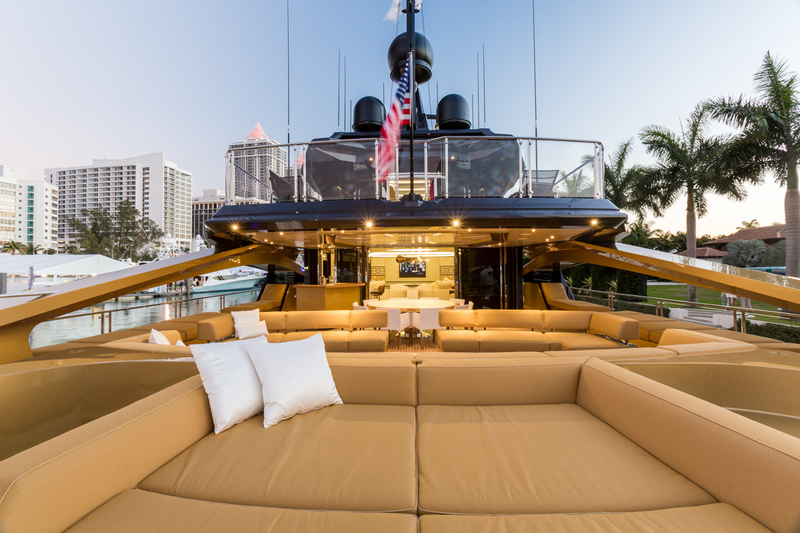 The crew of 9 will provide everything guests require for a relaxing and memorable holiday. 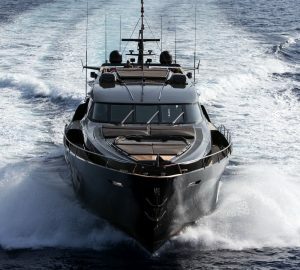 We do have available further amenity, owner and price information for the 49.00m (160' 9") yacht 49M SUPERSPORT MOTOR YACHT, so please enquire for more information.